Will She Or Won’t She? 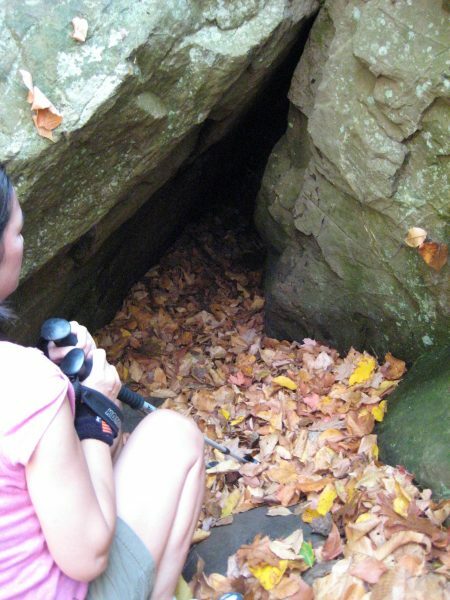 The cave known as Will Warren’s Den is one of Farmington’s historic landmarks. A bronze plaque dedicating the site to the town is affixed to one of the rocks above the narrow opening to the cave. In the 17th century, Warren, according to legend, tried to burn down the village of Farmington after he was flogged for not going to church. Driven out of town and pursued into the mountains, he was hidden in this cave by Native American maidens. CTMQ notes: Always with the “maidens” in these tales. In the 1870’s, a skeleton was discovered in Will Warren’s Den and it was believed to be Will himself. The office of the State Archaeologist conducted a forensic examination of the skeleton, however, and it did not appear to match any of the known aspects of Will Warren’s life. Is Will Warren a myth or real? We may never know. 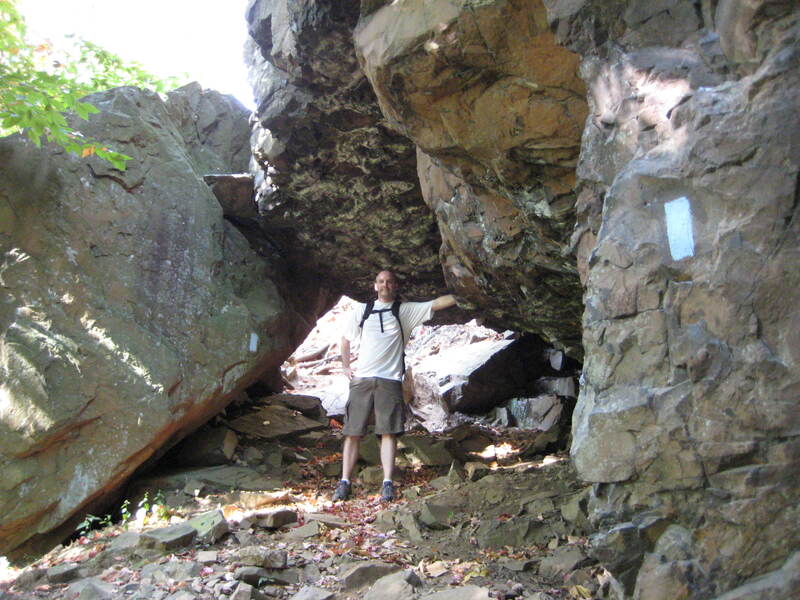 The den is underneath a massive jumble of boulders, just on top of Rattlesnake Mountain. The traprock ridge has crumbled over the millenia, resulting in giant square and rectangle blocks all over the summit area. It’s really a very enjoyable area – and pretty easily accessible by most anyone. We approached from a few miles south (Route 372 in Plainville) but one could also park at the hiker’s lot on route 6 and hike the simple mile or so to and from this spot. We contemplated entering the cave for a while – but the opening was just so small and it didn’t seem worthwhile after several crouch-downs and peer-ins. After finding the following on the Internet, I guess we made the right decision! The large room comprising the cave has two hard-to-find entrances. 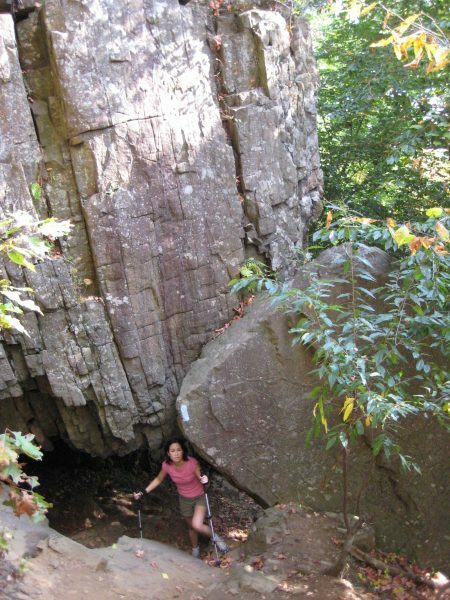 The upper entrance is not visible from the trail and requires climbing up the steep boulders to the top. This small entrance drops down 15 ft. to the main room on a sloping grade. Several old manilla ropes mark the passing of long ago explorers. A pitch-black 15-foot drop? I’m not sure Hoang would have forgiven me for that one. 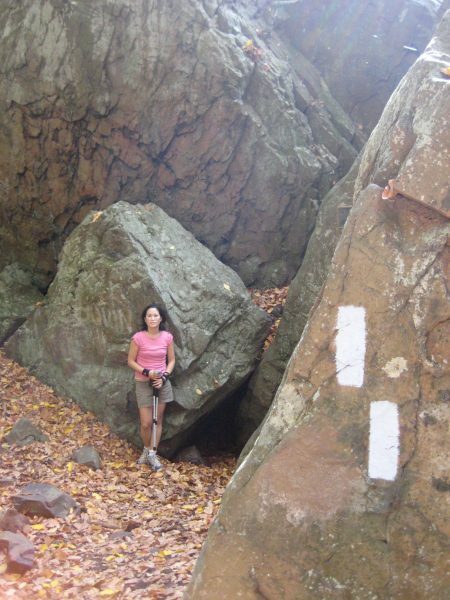 Since this page was originally published in 2007, several commenters below have called me out for not crawling into the “cave.” Perhaps I will revisit it someday; especially since there’s a nice hiker’s lot right on route 6 now. Another commenter has done some academic research on young Mr. Warren and offers some further insight below. I thought this story was pretty cool-not knowing whether this was fact or myth makes it much more mysterious! I think you and the Mrs. made the right decision. Hi, Just woundering on your trip on the southern approach to Warren Den, did you ever hear of Hospital Rock that is close by? me too. Looking for the hospital rock. Anyone have any clues. ? You should have crawled in. I crawled in yesterday and it was definitely worth it. Very cool. One of the most interesting features on the Metacomet. Way better than Tory Caves to the west. I crawled into it today, and its def worth it, like Tim said. Its like an air condtioned room inside with a smaller back room and a natural chimney. I had to crawl on my stomach to get in, but my 4 and 11 yr olds thought it was worth it. Thanks for this site! I grew up on rattlesnake mt. In the early 70’s. I was able to enter the den but only in the winter would I ever try this. The mt has its name for a reason. I remember someone had dug the entrance out a bit, but it only made the entrance about 30 in wide. Once I was inside, i was able to stand upright in about 80% of the cave. Towards the back , as I remember it, there was a pillar or rock that you could walk around. On the right side of this pillar there was a natural opening or vent. A fire would draft perfectly in the den and I do remember finding this out first hand. It warmed up nicely for a cave. The floor is mostly rocks and finding a spot to sit would be challenging. Hopefully this adds to the story. Just did this on my birthday last week. Hike took about 45/50 minutes. It was pretty cool passing by the radio towers which have to be the highest in Connecticut. The den, was a maybe 10 minutes after that. I enjoyed reading legend of Will, but I did not attempt to enter the cave because I was alone. Just past the cave, there is an amazing view up the hill. You can see for miles and even pick out Hartford. The legend of Will Warren is an amazing story with a hike a view to go with it. What a great day!!! 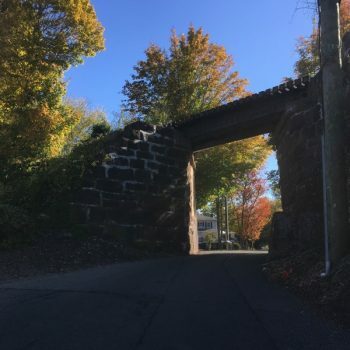 Oh, you can get the Metacomet Trail from Route 6 near Pinnacle Road and Reservoir Road. There is a small dirt pull off. Just look for the trails signs and you will be on your way!!! I’ve hiked several parts of the Metacomet Trail, but never made it up to the Den until yesterday. I was with my son’s cub scout pack, and it was absolutely gorgeous! A beautiful fall day, we couldn’t have picked a better one. When we made it to the large boulders the boys belly-crawled into the cave, marveling at the giant spider within. Just knowing that resident dwelled there was enough for me to stay out! But I thought it was great, mysterious and a little eerie, a very cool way to learn a bit about Farmington’s history. We are already planning the next hike! I grew up in New Britain and in the 60’s used to hike up Rattlesnake and Indian Head (across the valley from Rattlesnake) and camped overnight several times. Actually ate snake. Like one of the hikers said there is a column you could walk around and when young stand up straight. We did this countless times and climbed the face of Pinnacle Rock with the help of a rope. Too young to know better. Fun times and memories. We got chased by a big bull when crossing the valley to Indian Head. There was also a Nike Base just past Indian Head Rock. Up there was an old stone house and dug around outside and found Indian Heads which I still have. What a view. Great place. Homes in the valley now. I am a graduate student at CCSU researching Will Warren, He was born on January 24, 1716/17. 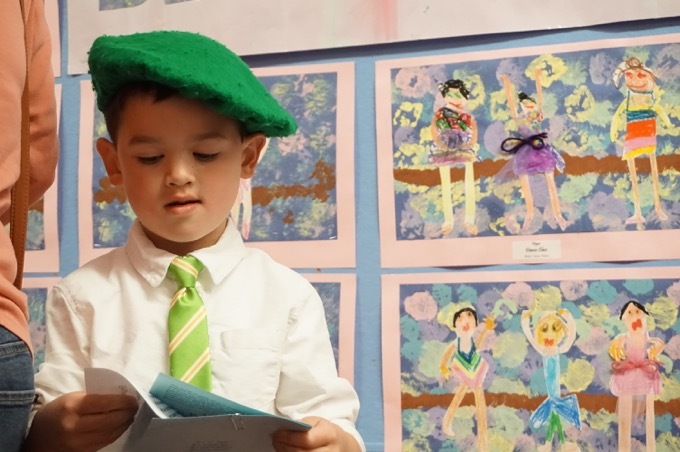 His parents were Abraham Warren (born in Hartford circa 1681) and Experience Stephens Warren (born in Hartford circa 1685). His parents were married January 10, 1704/05 by Rev. Stephen Mix. Will Warren was neither Native American nor African American. The skeleton found near his cave may well be his as it is believed to be that of a European American. All versions of the legend indicate that he was flogged in Farmington for breaking the Sabbath laws and that he fled into the woods and up Rattlesnake Mountain to the beautiful rocky area where his famous cave is marked today. The legends always include the one or more Native American females assisted him and that he lived out the rest of his days on the mountain with one or more Native Americans. Some versions mention children of Will Warren and one of the Native Americans living up there with him. 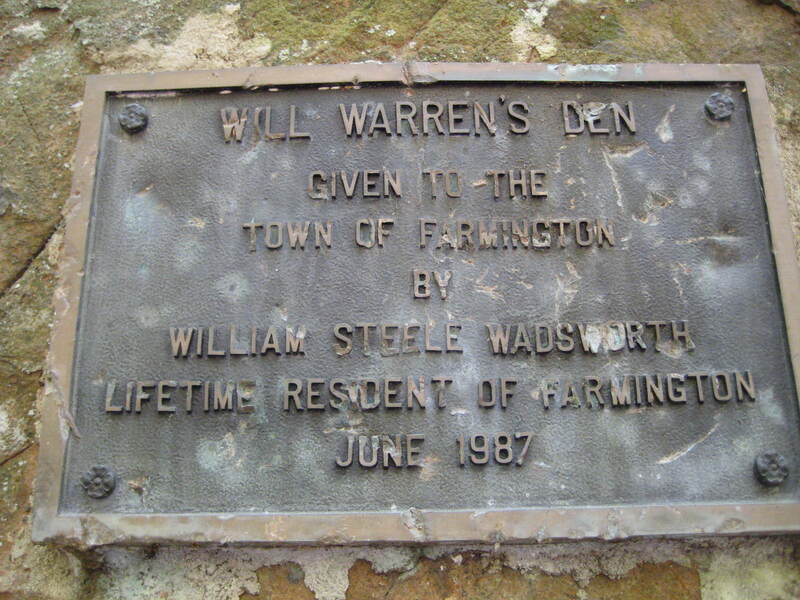 Will Warren was not from Farmington but more likely fro Wethersfield. Why he ended up violating the Sabbath in Farmington is part of the mystery I am hoping to solve.